It was just supposed to be a few days off from the scorching heat of the summer Sonoran Desert. It was not meant to be a transformational journey. If you know me at all, you’ll know that I rarely go on “vacation” or “holiday”. I generally must have a specific purpose to travel. I don’t even visit my family unless I can combine the trip with a workshop or seminar! (sorry folks 😉 ) But as I reported in my last post, I took the opportunity to leave the desert floor for a few days just to bask in the mild temperatures and beautiful alpine scenery of the mountains. If you knew the friends who kindly invited me, you’d know they take hosting seriously, and planned activities for the two full days I was there. I generally gamely go along with this, as who am I to dissent when they’re being such gracious hosts? I’ve stayed with these friends several times before, and as a result I’ve gone on long woodland hikes during the spectacular spring wildflower season; I’ve visited old mining towns; I’ve seen native arts and crafts; I’ve viewed prehistoric petroglyphs. This time, though, they outdid themselves—partially without knowing they were going to. As I was about to turn in for the night on the day of my arrival I was informed we’d be visiting a “Lavender Farm” tomorrow. —A what? I ought to win a prize in diplomacy for the way I kept a pleasant face on during the discussion. First of all I hadn’t known lavender was “farmed”; never thought much about it, and even if asked, I’d say lavender was some flower old British ladies liked in soap. Even after I’d accepted the idea of a lavender farm, the thought of spending my time there seemed a bit dorky and girly, quite honestly. So why would I want to look at a bunch of flower fields and then be strongly encouraged to buy…I don’t know, some…soap? Being a good sport and all, I went along, though, and asked myself 1. How long could it take, after all? and 2. How unpleasant could it be? We went. We saw field after field of blooming lavender of many different varieties. (I didn’t know there were varieties.) We learned some were medicinal, others, therapeutic. There was even a culinary lavender, a key ingredient in Herbes de Provence. And, speaking of Provence, I learned that city is the prime lavender producing region in the world. #2 is, as you might guess, the United Kingdom. Third on the list is, surprise, surprise, the very farm upon which I stood in the White Mountains of Arizona, USA! Apparently, the growing conditions are just perfect there, as the farm owner discovered when he planted some ornamental lavender in his garden. The rest—for his family—is history. After scenting my pillow with the lavender essence I’d purchased ( 😉 ) and having had a splendid night’s sleep, I awoke with great anticipation of what the next day would bring. We started out early, once again (I’m NOT a morning person!) on our way to something called “Little House Museum” of the old west. I don’t harbor much romanticism about Cowboy Culture, but I’d learned (am still learning) to keep an open mind. The curator of this unique multi-building museum is a descendant of an old Mormon family, sent west by their leaders to establish communities in western lands. Her great-grandparents had homesteaded, ranched, and farmed in the area, and this lady is carrying on the tradition. In addition to having old western style cabins and lodges for rent, trail riding, hiking tours, and fly fishing lessons, she gives guided tours of her private museum which contains artifacts from pioneer life of the 1800s. Many of the items are fairly standard: Pistols, saddles, clothing, and cookware; but she has the most extraordinary collection of player pianos, self-contained player-orchestras, and nickelodeons I’ve ever seen; all in perfect working condition and demonstrated by her. She explains how her father was friends with one of the Clanton gang, who missed getting killed at the OK Corral, but was later shot and killed just down the lane from where we were standing. Another of dad’s friends was one of the “Hole-in-the-Wall” gang (you know, Butch Cassidy, the Sundance Kid, and friends), who’d decided to go “straight”. This woman was a living historical artifact herself, right before our eyes! I’d seen the movies about the above referenced western gangs; I’ve even been to Tombstone, Arizona, and have seen the re-enactment of that famous gunfight. But somehow, hearing this woman describe her life and times made it all much more real. OK, now I come to—what was for me—the best part. My friends have lived in Arizona much longer than I have. They’re very familiar with the different areas, and had been to this museum a couple of times before but not for several years. We were informed that if we wanted to, (for four more dollars) we could tour the archaeological site. —What archaeological site?!? We glanced at each other, my hosts as puzzled as I. It turned out that, five years ago whilst plowing a field, a farm hand dug up the corner of an old foundation. Further investigation found buildings which had been inhabited a couple of thousand years ago. Indigenous peoples would destroy and bury any signs of their occupation when moving to a new place. We were told that the people living here would have broken all their pots, filled their former home with the pieces and with other debris, and then buried the site before moving on. This site was indeed filled with broken pots, many of which have now been reconstructed, and miraculously including one pot which survived intact. These artifacts are now on display, and the excavation of the site continues. It is believed to be one of the oldest and best preserved ruins of its kind and place. The archaeologist leading the tour was very knowledgeable about religious customs at the time, and, even though they were at first reluctant to do so, a local family of Hopi Indians (spiritual descendants of the original inhabitants) gave their blessings, and permission for the site to be excavated, as they believed it was Good Work for our times. They held a re-dedication ceremony, pictures of which are also on display. Our guide told us many stories of religious custom and beliefs, including why his native family believe this site was found now, in our times, as well as the message the stories depicted on the pottery have for us today. It must be that I exude intention to always travel with a purpose. I had no idea I’d be attending “workshops and seminars” on this brief and beautiful trip. I’m blessed with fabulous friends and a constantly unfolding, curious life path. As I sprinkled some Herbes de Provence on my bagel and cream cheese this morning, I took a moment to acknowledge appreciation for All that Is. “I’m off” in a couple of senses of the phrase. I’ve been feeling a bit out of sorts, lately—not ill, or anything like that, but just sort of…physically and emotionally uncomfortable. I have all my little tricks of the trade I can indulge in when this happens, but I think a contributing factor may be 105+ degree temperatures that have been going on for weeks, now. I may be deluding myself, but I don’t remember this from other summers. Sure, it gets well over 100 in June and July and August, here, but I seem to recall that it did not do that for days on end in past years; we’d get some days here and there where it would dip below 95. Is that just selective memory? In some ways I like it here in the summer. The huge flock of “Snowbirds”—people who escape from the harsh winters of the Midwest—starts to fly north at the end of May, and by the middle of June they are gone. This makes for much less traffic on the roads, and the shopkeepers and restaurant owners are thrilled to see us. “If you can’t take the heat, get out of the desert”, WE say. (Of course we say that muttering under our breath, behind closed doors, because actually winter visitors contribute MASSIVELY to our economy, so we don’t want to tick them off, but, subtly let them know they’re really second-class citizens). 😉 Keep in mind that the weather can get below freezing in the winter; it actually can be quite cool at times, and it snows in our mountains down here. Even, occasionally, a little bit of snow will reach the desert floor. But you wouldn’t believe it if you were here, now. So, the other way I’m off is I’m off to the White Mountains of Arizona for a few days. I have friends who have a summer cabin up there, and they usually invite me—isn’t that nice? The White Mountains are a beautiful part of our state, and about as different from the desert as can be. Whereas here I can go years without seeing an evergreen; in the mountains there are Pine, Aspen, and Oak. It’s truly an Alpine environment, and it snows, sometimes quite heavily, in the winter. There’s skiing in the winter, and golf in the summer—four actual seasons. I don’t ski anymore, and I’ve haven’t ever golfed, but I still like to go; it’s a refreshing change. Average daytime temperature this past week in Tucson, Arizona: 106F, 41C. In the White Mountains, Arizona: 83F, 28C. And, it actually cools off at night. So, you can see why I shall enjoy my brief respite. I’ll be back and replying and commenting again on Friday. In the meantime, I’ll offer you some desert gems, which regularly circulate around these parts in emails. While you may not understand all of them, they are (really!) literally true, and allow us to chuckle at and wonder about ourselves. See you Friday! Your Christmas decorations include a half a yard of sand and l00 paper bags. You think someone driving wearing oven mitts is clever. You’ve signed so many petitions to recall governors that you can’t remember the name of the incumbent. You can say “Hohokam” and people don’t think you’re laughing funny. You can hear that the forecast is 115 degrees without fainting. You can be in the snow, then drive for an hour and it will be over 100 degrees. People break out coats when temperature drops below 75 degrees. People who have dark cars or dark upholstery in their car are automatically assumed to be from out-of-state or nuts. You realize that Valley Fever isn’t a disco dance. You can (correctly) pronounce the words: “Saguaro”, “Ocotillo”, “Tempe”, “Gila Bend”, “San Xavier”, “Canyon de Chelly”, “Mogollon Rim”, “Cholla”, and “Ajo”. You know better than to get into a car with leather seats if you’re wearing shorts. Everyone’s smiling and talking about the great weather on rainy days. You have to explain to out-of-staters why there is no daylight savings time. It’s quiz time again! I facilitated groups on both Saturday and Sunday this week, so I decided to lighten up after the weekend with a quiz. The Hippie one matched my mood—and I agree with the results, except for the subversive part! I do in fact wear birks, and I sometimes smell of incense; this pegged me pretty well. You are a total hippie. While you may not wear birks or smell of incense, you have the soul of a hippie. You don’t trust authority, and you do as you please. You’re willing to take a stand, even when what you believe isn’t popular. You like to experiment with ideas, lifestyles, and different subcultures. You always gravitate toward what’s radical and subversive. Normal, mainstream culture doesn’t really resonate with you. As I saw my Hippie results, I noticed this California quiz. I’ve mentioned that I’m originally from San Francisco (land of Hippies, among other things) so the results weren’t too surprising, even though I’m choosing to bake in the desert at the present time. I do get needed doses of urbanity even so. Am I rich? Well, I feel rich, as I’m surrounded by beauty, culture, and interesting people; all I need. 🙂 California is such a diverse state—I’m curious where your inner Californian lives? You crave an eclectic, urban environment. You’re half California, half NYC. You’re open minded, tolerant, and secretly think you’re the best. People may dismiss you as a hippie, but you’re also progressive, interesting, and rich! …Popeye’s philosophy has helped shape my destiny! Perhaps that’s putting it a bit emphatically, but he was a great influence on my developing childhood sense of self. A lot of old cartoons were on the television on Saturday mornings when I was growing up. My parents worked on Saturdays, so, early in the morning, my father would leave for work, and then my mother would do what I used to call “fussing around”. That’s how it looked to me. In reality she was straightening the house, and making sure I had what I needed for the next several hours. Although I was very young, my parents’ business was just around the corner so they were never far away. After she left, if I didn’t have plans with my friends yet, I’d watch the Saturday morning cartoons. I also admired that, in addition to being strong, and self-confident, he was not afraid to accept help, when necessary. This help most often took the form of a can of spinach. I was one of many children, from my grandparents’ time to…now? Are kids still watching Popeye?…that acquired a taste for spinach from watching what it did for Popeye. I no longer enjoy canned spinach—too salty and mushy—but I did as a child; I was always trying to get my parents to serve it for dinner. Of course I wanted to be strong, like Popeye, but spinach was heavily marketed as being very nutritious, too, and if it was good enough for Popeye, etc… Ironically (that’s a pun, check back in 3 seconds to see why) when I was researching Popeye for this post (yes, I did spend some of my life doing that!) I came across this: “Early references to spinach in the Fleischer cartoons and subsequently in further stories of Popeye are attributed to the publication of a study which, because of a misprint, attributed to spinach ten times its actual iron content.” [from Wikipedia; article: Popeye] But, never mind, spinach made me “strong like iron” when I was six years old, and I challenge you to disprove that! An aside: Here’s an early video (from1933! ), wherein Popeye sings his theme song for the first time. He and Olive Oyl go to the carnival, where Popeye does the hula with Betty Boop! I liked this 7-minute segment until the very end, where Bluto, Popeye’s nemesis, kidnaps Olive Oyl and ties her to the train tracks. Why are villains always tying “damsels in distress” to the train tracks? Who does this in real life? There must be some primal mythology that explains this. What’s odd, to me, is that in the beginning of the film, Olive is dealing with Bluto just fine on her own, and has dispatched a couple of “overly friendly” sailors besides! Oh, well, generally, this cartoon is fairly forward thinking for 1933. The most compelling teaching of Popeye, though, was his definitive statement: “I yam what I yam and that’s all what I yam.” The first time I heard this I thought Popeye was championing another vegetable, one I didn’t enjoy nearly as much as spinach. However I soon realized it was his distinctive accent putting forth this gem of self-acceptance. Popeye had no illusions about his own intellect, for instance, or his social standing. He was content with who he was. In my family, contentment was a rare thing. It seemed we were always striving for something. I can’t think what, looking back on it now. In another article an author reported that his phrase “may be seen as an expression of individualism”. This might have been considered subversive in some times and some cultures, but I took it to mean that my unique self was valuable, just as it was. This underlying belief sort of “got me through” the often difficult teenage years. I knew I’d be able to express as myself…eventually. To reinforce these thoughts, a musical production came to my attention in later years. A particular song, I Am What I Am (there’s a theme, here) spoke to me, and I get tears in my eyes to this day when hearing it. This video shows a wonderful performance of that terrific song. In any event, I’m grateful for Popeye showing up in my life, just when I needed him. Just like the hero he is. Toot, toot! OK, I’m all blissed out! I’ve lived here for several years, now, and I continue to discover that southern Arizona is amazing! I came from a large metropolitan area, where EVERYTHING is available. I leave it to your imagination what “Everything” entails. Around here, though, Everything I WANT is accessible. It’s just not obvious. I keep discovering gems of artistic excellence ’round these parts I’d never have guessed were here. On Wednesday evening (under a beautiful full moon) I attended the Wave1 gathering I spoke about in this post. It was a time for people of many different backgrounds to come together and spend some time focusing upon what unites us rather than what divides us. There were performers highlighting many spiritual traditions, including some I’d had no idea were represented in my part of the world. Tony Redhouse is a local celebrity; I’d heard and seen him and members of his family before. He comes from the largest American indigenous tribe, the Navajo, or Dinè. He is an ambassador to all tribes and all people. His chants touch many souls. He sings, chants, plays flute and other instruments, and has a talent for setting sacred space. One of his videos contains not only his beautiful music (good for meditation), but features some of the most beautiful pictures of our desert I’ve seen anywhere. It can be found here. Another local character is Allen Smith, virtuoso Didgeridoo player, who also participated. I’ll bet you didn’t know that Tucson, Arizona is the western American didgeridoo capital? Who would have thought that this native Australian instrument would have found such a home here? This article explains how & why. There is a huge didge festival each year, where people come from all over the world. A local part-Cherokee resident discovered that our local Agave plant makes splendid didgeridoos, as he discusses in this video. I attended a didgeridoo workshop a couple of years ago by yet another itinerant didge player and teacher. There were about 20 of us, and I was astounded that more than half had brought their own instruments. I managed to get some good tone out of my borrowed one towards the end (it’s hard! ), but it would take a long time to master the circular breathing technique required. Mr. Smith, at the Wave1, produced sounds I’d never heard before from this instrument, fostering a deep sense of peace within the audience. I didn’t know there was a Thai Buddhist temple in Tucson. Three of their monks shared an absolutely awesome chant with us. Their performance was polished, but beyond that, I could hear many, many years of tradition broadcasting through their voices. I have not been able to find out much about their monastery, or indeed why they are here. These are not American converts, as are most of the Zen Buddhists I know, but monks from Thailand that have established a monastery in Tucson. These are just a few of the individuals and groups participating. The ceremony was held in a spectacular, beautiful Roman Catholic sanctuary, unusual in that it is a “church in the round” setting. The worldwide event was simulcast on two screens. This may become an annual event; if so, I’ll let you know! Om Peace. I’m not sure what this post is about. Is it a new game review? Is it a philosophical treatise? Is it a muse upon the nature of friendship? Perhaps I’ll know when I get to the end. The stimulus for this particular piece of writing is the release of a new game from one of my favorite designers. The game is called DREAMS, or Des Rêves Élastiques Avec Mille Insectes Nommés Georges. OK. There’s the first, of many, odd and interesting things about the game. The acronym is in English (DREAMS), but the words the letters of the acronym stand for are in French. The translation, from the French is: “Elastic Dreams with a thousand insects named George”. THAT acronym would be EDWATING, which sounds a bit like an insult in British to me. Although I’ve played the game five times now (it’s fairly short—I do have a life! ), I have not found anywhere near a thousand insects, with or without the name of George, as yet. I did meet a lizard called Jim and Genevieve, the mock-turtle, but I guess I’ll have to go back to look for the insects. But, to resume from my first paragraph: I’ve said the game is from “one of my favorite designers”. Just what do I mean by that? Well, her games HAVE appeared on a couple of my famous (I think I had 7 or 8 readers for those posts) “Top Adventure Game” lists, and did so before I knew very much about the designer. (See topic “Games” in the sidebar for the lists.) I’d just been cruising around for adventure games to play, because I like them, and they keep my mind sharp (well, some of them do), when I came across “Deirdra Kiai Productions”. Played one. Liked it. Saw that another was just out. Liked it—And it’s perspective; philosophy; inquiry. Got curious about the person behind the games, and I’ve NEVER done that before. Sure, I’ll read this and that about her and him, but I’m not a “Fan”, usually. It’s just that this person seemed to value having a social consciousness expressed in her games. I found that refreshing. I liked that there were explorations of social stereotypes instead of just playing to overcome obstacles and bring “good” back to a world gone mad—however graphically intriguing that world might be. So, I began to read her blog. After a few comments and insightful observations (if I do say so myself), she began to read mine. A mutual respect began to develop. Now, when I say she is one of my favorite designers, it not just about the games themselves, but about the person that she is. What I’m wondering, though—and I haven’t been in this position before—is does my respect and affection for the person of Ms. Kiai affect my judgment about her games? Of course it does! How can it not? We all want to like and support our friend’s “stuff”, whatever that “stuff” may be. So, I wanted to look at that as an issue before I continued giving my lofty opinions about her latest game. I have a couple of friends who are painters, quite a few who are musicians, and some who are writers. I will often attend their performances or read what they’ve written to “support” them. I’ve realized, though, especially lately, that I’m not always a champion of their work. I usually like to experience it, but if it’s not to my taste, I will either retire quietly into the eaves, or if called upon to give an opinion, mutter something like “I particularly liked the ‘cello in movement three…” I have found that as I “mature” (well, it’s all relative) I’m increasingly able to separate loyalty from personal taste. Another clue is that I have no obligation to say anything about DREAMS whatsoever! I certainly never said I’d talk about all Ms. Kiai’s games. I did say I’d play anything she produced, and I still hold to that. So with all those disclaimers in place, including this one—I suppose I am rather predisposed to “like” Kiai’s games, but remember I came to them initially without knowing anything about them—here’s (finally) what I think about it. DREAMS contains one of the more innovative concepts I’ve come across in gaming. Ms. Kiai has been exploring branching dialogue in her games recently, with multiple storylines and endings. Although a bit unsettling sometimes, I like this, as it flows more like real life. After all, who sets out upon an adventure knowing there is an exactly defined end to the quest? Sure, we have a goal: “Hike to the bottom of the Grand Canyon”, but we wouldn’t want to know that no matter what we do along the way, we’ll have to keep to the path and have the same predetermined experience as everyone else does who starts on the hike. A wave of peace on June 18. Wave1 is a unique event which is inspired by those who meditate upon the qualities of love, joy, and/or peace. Many of us have participated in “World Peace Meditation Days” where we all meditate at the same exact time, no matter where we are in the world. These are usually at 4am or so in my time zone, which is a time of day I’m not usually very aware! This new event takes place between 7 and 8 pm in YOUR timezone. The thought is that a wave of peaceful thoughts will flow around the world. There are many live local events scheduled in various cities all over the planet. I will attend the nearest one to me, in Tucson, Arizona, USA, and you can check the map on Wave1’s website to see if there is one scheduled near you. But you needn’t attend an event or be with a group to participate, if you feel at all drawn to this. Just sit quietly for anywhere from 10 minutes to one hour, starting at 7:00 pm, YOUR time, on Wed. June 18. Focus on qualities, people, or places that feel peaceful to you. Invite your thoughts to join with others in circling the globe on this auspicious day. If you have a chant, meditation or prayer practice, this will be a good time for that, too. The local gathering I’ll attend is: “A multicultural celebration that will feature sacred music and prayer from all over the planet.” Theoretical physicists are finding more and more evidence to support the notion that thought can affect matter. At the very least, I expect many participants (including myself) to find a few moments of joy and peace within themselves. And that can only help us all. Peace, Salaam, Shalom. I finally got ’round to seeing Indiana Jones and the Kingdom of the Crystal Skull. I decided to report on it a bit on Father’s Day, as there are several father figures in the film. Those aspects of the movie are done well, I think. I like how the threads come together in the end. Most reviews and blog posts about IJATKOTCS (and there have been a lot; apparently there’re quite a few fans) have described the adventure and story aspects, and thrown in a few character evaluations. These are most useful if you are trying to decide whether or not to go see the movie. I won’t be able to help you with that decision here. There are those who claim these skulls are very ancient, and were either created using “alien” technology (as perhaps the pyramids were) or that the crystal itself holds patterns of thought imbued upon them by ancient cultures which can benefit us today. What interests ME in all this is how the film used the skull mythology along with the “Roswell Alien” stories combined into one story line. Whether or not one believes in “aliens” or “skull power”, the details surrounding these cultural myths were incorporated into the movie seemlessly. I have not seen any writings which portray what happens at the end of the film with the skulls, but the film does build its end-story from metaphysical propositions which have been around for years and years. And, there really exist some skulls carved or formed from large pieces of quartz crystal; of that there is no doubt. Why they were carved (who would do this? ), when they were carved (ancient or modern? ), and whether they have any useful properties other than as artifacts is still very much in question. I’m hoping to chat with someone from my area who did go ahead and spend the $100 for a private audience with the Mitchell-Hedges skull, to discern if they experienced anything remarkable or unusual. If I find such a person, I’ll let you know. I had an interesting Father’s Day. I met with a group which included several fathers, and wished them well. When I left the meeting, people started pointing straight up into the air. I looked, and saw something I’d never seen before. The sun was high in the sky, and there were a few wispy clouds. Around the sun, at some distance from it was a ring, almost like a corona, except it was multi-colored like a rainbow! It was a perfectly round ring, and stayed up there for several hours. Some time ago I’d posted about something beautiful and remarkable called a “Fire Rainbow“, but that was just a picture I saw in passing, I hadn’t seen it with my own eyes. This thing I saw was not like the fire rainbow, inthat it was a ring. The closest thing I found online about this was something called a “Sun Dog” This picture is not very clear (it must be hard to shoot looking directly at the sun) but it is like what I saw. It was just 10 times more beautiful in “person”. 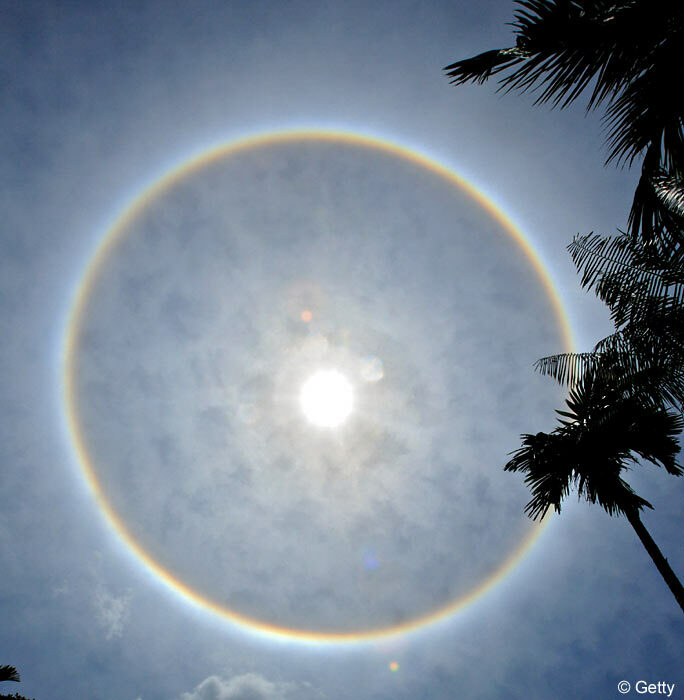 Happy Father’s Day to all you Sun Dogs who live in countries which celebrate it in June! Recently my dear friend asked me to write something “upbeat” for an organizational newsletter. Last time he did this, he also suggested I comment on a fairy tale’s wisdom for our times. After that, I vowed never to let him dictate my topic choice in the future. The following is proof of the inadvisability of saying “never”…. “Why don’t you write about…. “What”? I said, uncovering my ears in dismay. “Not that little ‘goody-goody’ girl”! Well, I won’t report the entire conversation, as it disintegrated from there. It turns out, though, that I had never actually read the story of Pollyanna, and realizing I was judging something “I knew not of”, I set out to do just that. Synchronistically, I saw in the television listings that public television was planning to air a film version of Pollyanna the very next week! I was hooked. The topic was set. As a child, I’d often heard people say about someone “Oh, s/he’s SUCH a ‘Pollyanna’” in dismissive, sometimes even sarcastic tones. I got the impression that not only was Pollyanna a “goody-goody”, but she was even sickeningly sweet. People would use the term ”a Pollyanna” as if it were naive and silly to be an optimist, to see the good in things. She certainly–and this was a huge putdown at the time–was ”uncool”. For my latest exercise in suspending judgment, I borrowed the book from my local library (Pollyanna, by Eleanor Hodgman Porter, 1913), and later watched the PBS film. I won’t give away the story, but it seems that Miss Pollyanna is very much an early 20th century New Thought practitioner! The gist of her philosophy is: “In any situation, you can always find SOMETHING to be glad about”. We are constantly told to “look for the good”. If more of us did that, more of the time, we’d truly transform the world. Her story really isn’t the least bit “sissy” or “goody-goody” as she slowly helps to transform the lives of those around her, after experiencing real tragedy in her own. As I read (and by the way, very much enjoyed) Pollyanna, I decided to do my best to always find something to be glad about. I feel blessed that, in my life, this is a pretty easy task. Thank you, Pollyanna. I had the most delightful and emotionally satisfying experience recently. I attended a meeting at our local community group of the Institute of Noetic Sciences (IONS). This organization, among other things, hosts monthly speakers on the topics of “Science and Consciousness.” For me, at least, these two items encompass just about everything I’m interested in, one way or another. I enjoy learning about science because I enjoy it, not because I find its methods conclusive. Sometimes it does contribute to my sense of rightness about my chosen course: “See, I told you! I was right all along! Scientists have discovered a spot on the 3rd chromosome of the 16th strand of DNA which explains why I’m grumpy in the morning! It’s not my bad attitude, it’s my genes!” …Of course, I tend to ignore the scientific results that do not support my justifications for my own behavior. But, hey, I do that with religion, too, so at least I’m consistent. So, you can see why I like IONS. The presentation for this particular meeting was entitled “An Interfaith Panel representing Buddhist, Catholic, Jewish, Muslim and Protestant faiths – ‘The End of Life and Beyond: An Interfaith Perspective'”. Obviously this particular topic leaned further towards the “consciousness” area than the “scientific”, although there were some surprisingly scientific dimensions to the discussion. IONS decided to invite this panel after the IONS group coordinator heard a similar panel discussion at a Hospice event. Before I write further about the panel, just let me put in a plug for Hospice. Everyone associated in any way with this movement is to be commended, in my opinion. Hospice, is, basically, near-death care, including physical, social, and spiritual components. I could do an entire post about Hospice and my experiences with it, and perhaps I will. I’ll just say here that they are committed to honoring those who may be about to die, and that includes helping them sort out their spiritual beliefs during this critical time. The panel was made of of people the Hospice director knows personally, and who, in most cases, work with the hospice patients as spiritual counselors. There are certainly other traditions which could have been included; for instance there are many Hindus and Sikhs in my area; but the meeting would have gone on for hours and hours if every perspective one could think of was represented. As it was, these panelists presented a wonderful, diverse, and yet complementary and respectful discussion about end of life and afterlife issues. Each panelist gave a brief explanation of their tradition’s perspective on what happens after the body dies, and then followed with their own particular spiritual beliefs. It was surprising that there were often discrepancies, or slight alterations, between the personal beliefs and the mainstream religion’s “party line”, if you will. It seemed to me that everyone must personalize their religious beliefs (or lack of them) to some extent; we are all individuals, after all. The most surprising thing to me was that every one of the panelists stated that we cannot know for sure exactly what happens to “us” after we die. I’d thought that, with at least a couple of these religious philosophies, there were cut-and-dried, prescribed beliefs. And it could be that these five individuals don’t really represent the main teachings of their faiths. Even so, the responses ran from “We leave the details up to God”, to “There is beauty, and comfort, in the not-knowing.” As individuals, all said they believed that there is a part of “us” that does continue to exist. Whether it is “us” as personality, or “us” as soul, or “us” as a minute particle in the stream of consciousness remains to be seen. I know in the scientific/consciousness community there is a continuing debate about “where consciousness resides”. Is it strictly a neurally-generated process, which shuts down upon our physical death, or does some part of our thought exist independently of our physical cells, both before and after physical incarnation? The panel at the IONS meeting certainly came to no conclusions about that. I came away with this perspective: These five people, at least, were able to treat each other with respect and appreciation for each others’ views. They weren’t just “tolerant”, they were actively, joyfully curious about each other and the larger World. Would that such dialogue exist amongst us all.